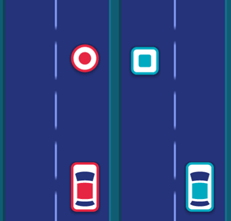 Two Cars is a minimalistic addictive game where you need to control two cars at the same time. Do you think it's easy? Just try it and you will find out. You control 2 cars at the same time. Collect all the circles and avoid all the squares. The cars are slowly accelerating. This game will test your multitasking skills! Play Two Cars online for free and enjoy! 6 or navigation key right — change the lane of the right car.